Seamap Australia was honoured with two industry accolades at the recent 2018 Tasmania iAwards ceremony. 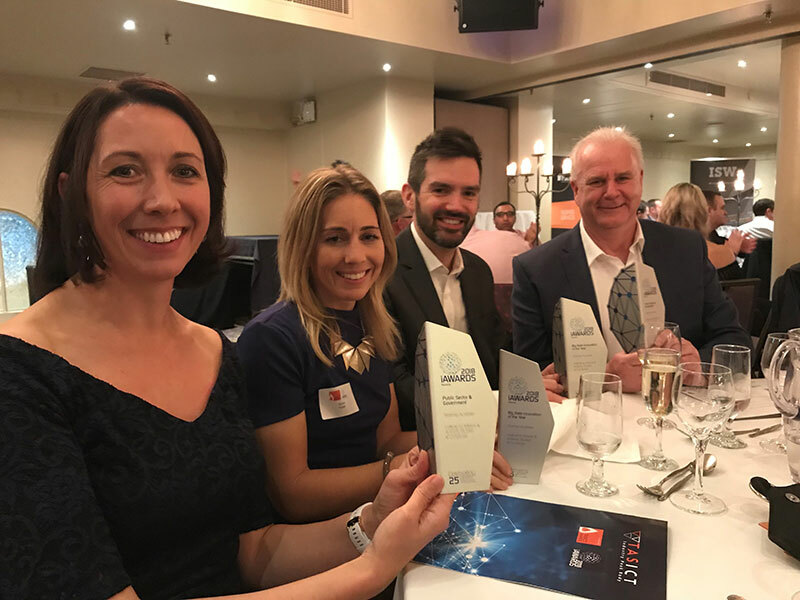 The team took out the‘Big Data Innovation of the Year’ and ‘Public Sector and Government’ categories at the state event, which is part of the Australian Information Industry Association (AIIA) iAwards, the nation’s leading awards program for innovation in the digital economy. In a nation first, Seamap Australia brings together all available marine survey data of seafloor habitats and depth to create a continental-scale, consistent, marine habitat mapping service. The research is conducted at the Institute for Marine and Antarctic Studies (IMAS). Science project manager Dr Vanessa Lucieer said knowing the structure and biology of the seafloor is a critical factor influencing the understanding of coastal erosion, storm surge impact, tsunami risk, distribution of marine habitats, accounting of marine assets such as mineral resources and fisheries, and safe navigation. “Receiving these awards presents us with an opportunity to promote the significance of this project and highlight the fact that 80% of our nations’ marine estate remains unsurveyed,” she said. Professor Craig Johnson, project chief investigator and a pioneer of open data principles in marine science research, said the awards were a great honour for the University of Tasmania and the project team. “This project is a wonderful example of the power and utility of placing data in the public domain ensuring far-reaching benefit and impact for government, industry and the broader Australian community,” he said. Seamap Australia project team including Dr Vanessa Lucieer, Mr Peter Walsh, Dr Emma Flukes, Prof Craig Johnson, Ms Claire Butler, Dr Mark Hepburn (Condense), Mr Oliver George (Condense) were thrilled to receive the awards on behalf of their national collaborators. “IMAS, through collaborating with local IT company Condense, is a testimony to the quality of Tasmanian skills and resources available to drive projects of national and global impact,” lead technical project manager Peter Walsh said. AIIA CEO Rob Fitzpatrick said each year the awards shine a light on the exceptional achievements of those at the forefront of Australian innovation, and the projects shaping our modern economy. “We're proud to provide recognition and encouragement to people prepared to bring an idea to life, enabled by technology. Whether they're in start-ups, the public sector, community services, academia, or private enterprise, small and large, the work of the finalists is an inspiration to us all," he said. Seamap Australia is funded through the support of the Australian National Data Service (ANDS), as well as the Integrated Marine Observing System (IMOS), National eResearch Collaboration Tools and Resources (Nectar) and Research Data Services (RDS). The supporters are all facilities of the Federal Government’s National Collaborative Research Infrastructure Strategy (NCRIS). Image caption: Project team members from Seamap Australia attending the 2018 Tasmania iAwards ceremony (from left) Dr Vanessa Lucieer (IMAS), Dr Emma Flukes (IMAS), Oliver George (Condense) and Peter Walsh (IMAS).